Nov. 4, 2017 6:30 a.m. Possibly one of the most famous icons in Prince Rupert right now is a deer. On Aug. 14, the young buck’s antler became tangled in a backyard hammock on 6th Avenue East. The police were called to rescue the deer and after an approximately 30 minute struggle he was freed with part of the hammock still attached to his antler. Since then, he’s been roaming the city and attracting followers who snap photos and post on a Facebook page titled the “Chronicles Of Hammy The Deer Official Page.” The page has more than 400 members, with photos being added daily. 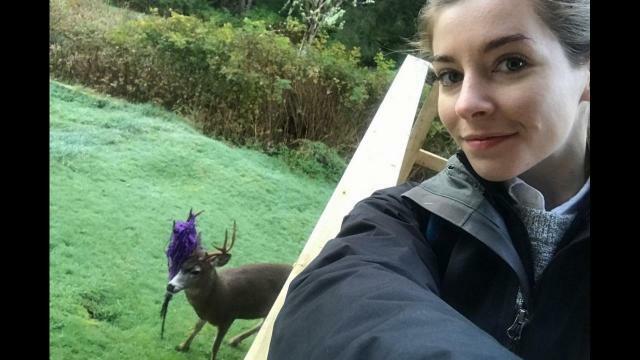 Marcedés Mack started the Facebook page after she spotted the deer in her neighbour’s backyard when he was caught in the hammock. She stood outside in the rain until he was freed, but she couldn’t forget that buck. “I constantly thought about how Hammy was doing. I kinda felt an attachment so I figured if I started a page for him I can bring the community together to keep ‘tabs’ on Hammy for me by sharing pics and stories. [It’s] also a place on Facebook for the locals to go and enjoy his journey around town,” she said on the page. The deer has been seen using the crosswalk, eating greens in backyards and on Nov. 1 he frequented Fraser Street in front of the Northern View newsroom. The excitement is real for some who see Hammy for the first time, and the deer continues to win hearts every time he crosses someone’s path — proof is in the social media posts and selfies that usually follow. On Halloween, a few residents dressed up as the deer, with the iconic purple rope wrapped in a set of antlers. There are even Hammy T-shirts for sale by Haley Apparel. The shirts sold out in a day, said Christy Allen, e’Klektik Trading shop owner. She had 14 shirts at her store and now she’s taking pre-orders for more. Profits from the T-shirts are being dedicated to the Prince Rupert Wildlife Rehab Shelter. “Hammy is an icon. Everyone has seen Hammy. Everyone is concerned about the welfare of this animal,” Allen said. The conservation officer knows about the hammock deer but has no plans to untangle the buck as he will eventually shed his famous antlers. Mack is hoping that when that happens whoever finds the antlers could possibly raffle them off in a fundraise for the wildlife shelter, or donate them to either the museum or a place in the city as a historical monument.